I went to the NYC public schools in the 1940's and 50's. They were safe, rigorous, and clean. The teacher's were well educated, motivated, and made sure that each student worked to their capacity. All of my friends went to the same public schools and we all grew up to become professionals. The halls were quiet and orderly. Those students who were academic went to one of the four city colleges which were free, while those students who were not were able to go to a vocational high school that gave them a skilled craft(- automotive, aeronautics, baking, nursing, electrical, manual trades-). When contemporary public schools meet the above mentioned criteria parents flock to send their children to these schools- Hunter College Elementary and H.S., Stuyvesant H.S., Townsend Harris, Bronx H.S. of Science, Brooklyn Tech., Staten Island Tech in no particular order of quality - including the so-called 1%. Yep. I think it fell apart for a number of reasons. The schools lowered behavior and academic expectations, and that's always a disaster. Talented women, no longer barred from other professions, chose to be doctors, lawyers, or professors rather than teachers, and we have been unwilling to make wages and working conditions for teachers competitive. My mother, herself a NYC public school graduate, did some teacher evaluations for the BOE and was shocked at what has happened to the quality of the teachers. She compared the current crop to cocktail waitresses. These days the typical education major is in the bottom fifth of his college class. Back to the discussion of the parent letter here: Opting Out of Homework. Now that I've communicated with Alfie Kohn I understand that this letter really was written by a parent, not by him. (Come to think of it, is there a man on the planet who would dream up "I respect you as my child's teacher"?) Of course, it is still a sample letter in the sense that Alfie Kohn put it on his website in the hope of inspiring other parents to write similar letters. I certainly agree with the intent of this letter — to get a first-grader out of homework. But the tone of the letter gets on my last nerve. I am so done with the way parents are expected to address their childrens' teachers. It's beyond simple politeness; it's really subservience. "I'm sensitive to your concern that learning be supported at home, and I intend to do this as best I can." Oh, for heaven's sake. Who works for whom here? Shouldn't we hold the teacher accountable for doing educational activities with our child, instead of allowing the teacher to think that's the parents' job? I think all this bowing and scraping is a mistake. It just confirms the idea, already staunchly held by teachers and administrators, that they are the experts, they are in charge, and we parents are just standing by breathlessly awaiting their orders. This is why we routinely get patronized and bossed around. Let's not encourage it. I say it's time to take back our home lives. Home is not an annex of the school, and we aren't volunteers. Our children belong to us, not the school. We should speak to teachers as equals, and not approach them hat in hand, begging for scraps. In today's NYTimes, Ritalin Gone Wrong. I was glad to see this article, which confirms some of my skepticism about the ADD epidemic. But it fails to mention what seems to me the most important feature of ADD — it is a disease of school, as discussed in this article by Peter Gray. via Happy Elf Mom's blog, Mom of autistic son facing jail time for multiple tardies that have added up to a truancy offense. Outrageous. Whole Brain Teaching all day? One of the comments that I mentioned on my blog as well is that the WBT videos are used to display WBT techniques. They do not show an entire class. Since the video is used to highlight a specific technique, other aspects of classroom life are edited out for timing purposes. Right, I've seen this argument before. I say, "How can you stand to spend the day doing this tedious, loud, pre-scripted nonsense?" and the reply is, "Oh, we don't do this all day." It reminds me of a saucy English postcard I found somewhere on the internet, showing a young couple canoodling on the couch. Young Lovely: "No, Bert! I won't trade an hour of pleasure for a lifetime of shame!" Bert (hopefully): "It won't take an hour." 1.) Really? I'd like to see a video showing a WBT teacher engaging in some other kind of activity, like actual classroom discussion where kids make un-scripted remarks. Considering that there's about 8 billion hours of WBT videos on youtube, there ought to be at least a few that show something besides the standard call-and-response-with-gestures. 2.) So what? I wouldn't want my kids spending 30 seconds vowing to "keep their dear teacher happy." I wouldn't want my kids being told to say "Oh sweet mama, I want some free time!" as Chris Biffle has them do, or being told to groan because a classmate wasn't paying attention. This isn't education, it's just control freakery. In New Hampshire, a law was passed to allow parents to object to curriculum. Under the terms of the bill ... a parent could object to any curriculum or course material in the classroom. The parent and school district would then determine a new curriculum or texts for the child to meet any state educational requirements for the subject matter. The parent would be responsible for paying the cost of developing the new curriculum. Now, much as I would like to see schools take parents seriously, I can't see how this would possibly work. For starters, think of the time and effort that would be eaten up "determining the new curriculum" for one child. And how could the teacher, who is already juggling everything from the learning-disabled to the gifted in one overcrowded classroom, also oversee different curricula for different children? It's impossible. Suppose I marched into Younger Daughter's classroom and told the teacher that I think Investigations is nonsense and I'd rather have Younger Daughter learn Singapore Math (true enough!). Does that mean the teacher now has to keep a different set of books for my daughter, and tutor her with Singapore Math? What would the rest of the kids be doing while this was going on? Could I specify that I don't even want my child to be exposed to Investigations, so they'd have to take her out of the room while the other kids were being taught? Suppose there's another parent in the room who objects to both Investigations and Singapore Math, and insists on Saxon Math for her child. Now what? We need parental input into the schools, but it should be at a much higher level, where the curriculum is chosen in the first place. Tweaking the curriculum one child at a time is madness. In today's NYTimes, One Percent Education. via Kitchen Table Math, an essay by Peter Mayer. [Martin Luther King] was of the earth. He wasn't just talking about "live so you can be happy in Heaven" — he wanted to be happy in Mississippi! The older I get, the more shocked I am to remember how very young Martin Luther King was when he was killed. He was only 39. He was born the same year as my father, who is still around today, age 82. If Martin Luther King could come back and visit America today, what would he think of our situation now? Martin Luther King, at the end of his life, was working on the "Poor People's Campaign". He was in favor of the redistribution of wealth and a guaranteed minimum annual income for the poor, which would enable families to climb out of poverty. We've gone in the exact opposite direction from what he had in mind. In 2012, we have less economic mobility than Great Britain. If you're born poor in the United States, you will almost certainly remain poor for the rest of your life. One of the first issues tackled by the civil rights movement was the desegregation of schools. Back then, Southern schools were segregated by law, and the black schools struggled with less funding. Black children who were really middle class, the children of ministers and prosperous farmers, were held back by being forced to attend low-quality schools. When desegregation cracked open doors that had previously been slammed shut, black people with energy, talent, and ambition (many of them already in the top rung of black society) naturally rushed through those doors. But the unintended consequence was that they left behind their neighbors in poverty, whose situation has been steadily worsening. Today, our public schools have been resegregated. We're newly segregated by college and professional-school attendance too. Today more than ever, our ruling class is the product of Ivy League schools whose exclusive admissions policies give an edge to the carefully-groomed children of the rich. Our Supreme Court is stocked only with graduates of Harvard or Yale Law schools; our last several presidents got degrees at Harvard or Yale. Our most recent non-Ivy president was Ronald Reagan! Obama, in spite of his pigment, is a natural member of the upper class, starting with his private school education (he never spent a day in an American public school). I've been reading the new biography of the Obamas by Jodi Kantor (I recommend it), and what strikes me most about Obama is how typical he is of upper-class careerists. He's all about climbing the ladder, which of course he's done spectacularly well. It should really not be a surprise that Obama perpetuated George Bush's tax cuts for millionaires; those millionaires are his friends, colleagues, and campaign donors. Today's segregation is about economic class more than skin color, but it's just as destructive as the old segregation. And, just as in the days of Martin Luther King, American schools are part of the machinery that divides the haves from the have-nots. Each tree had 56 oranges. If 8 slaves pick them equally, then how much would each slave pick? If Frederick got 2 beatings per day, how many beatings did he get in 1 week? 2 weeks? Frederick had 2 baskets filled with cotton. If each basket held 5 pounds, how many pounds did he have all together? Susan B. Anthony was fined $100 for voting for President. She only had $25, how much more did she need to pay the fine? After I saw the Susan B. Anthony question, I realized that "Frederick" in the problems above was probably meant to be Frederick Douglass. Right? How did these questions get sent home with the kids with no-one at the school saying "Wait a minute! This could cause offense!" It's mind-boggling. Happy Martin Luther King Day, everyone! 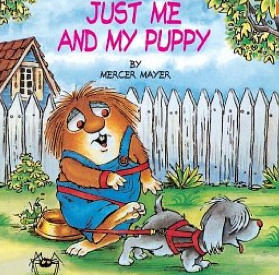 Recently, Younger Daughter's been reading Little Critter books, by Mercer Mayer. I recommend them highly. Younger Daughter likes them a lot; she'll read two at a time with great enthusiasm. They're funny, so parents can enjoy them too. And, in contrast to Whole Language "look at the picture and guess" books, the pictures in Little Critter actually offer a second narrative which is opposed to the text. For instance, where the text is "I teach my puppy how to heel", the picture is the one shown above, where the puppy has wrapped the leash around his young owner. Where the text is "My puppy knows lots of tricks ... how to sit ..." the puppy is shown lying down; "how to play dead ..." the puppy is chasing a butterfly while his owner lies down. You get the idea. So, if your child is "reading the pictures" instead of the text, Little Critter books would be a good antidote. When I work on Singapore Math with Younger Daughter, I always have her read the directions out loud. For some reason, Sing Math often uses the word "altogether", as in "How many stamps do they have altogether?" (The curmudgeon in me wants to point out that "all together" would be more correct, but let's let it ride.) Anyway, YD consistently tries to read "altogether" as "together". Me: "No, it isn't 'together'!" 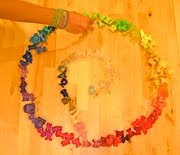 Read all the letters in the word." YD: "So what? It means the same as 'together'." This is exactly the kind of thing Whole Language advises; if the kid says "pony" instead of "horse", that's OK, because the meaning's about the same, right? But of course, there are no two exact synonyms, and there are all kinds of contexts where it might really matter what word was chosen. If YD comes across a sentence like "Jude Law was in the altogether", I want her to appreciate it, or at least READ IT CORRECTLY. Argh! I swear that kid is on her way to a PhD in Winding Mom Up. I have a great example of the damage a reading log can do. We have a set of twins in fifth grade. One twin has me…personal conferences to set reading goals/ talk about books 3x a week. The other twin has different teacher with a log and a 20 minute a night requirement. The mom came to me to ask for help because the girls are of equal ability and yet they are performing very differently. The twin that has me has finished 8 books already and reads nightly for long periods of time on her own. The other twin has finished one book. She asks her mom to time her and stops at exactly 20 minutes. Its sad! How can that possibly improve her reading. And it’s not just the amount of reading completed, its the attitude about reading. Some teachers on here are saying the log promotes responsibility, but I believe it hinders it. Give students the power and trust them, they just may surprise you!